Mop-up operations are underway, but the Iraqi national flag now flies over the city, and ISIS is broken. Iraqi forces should be moving quickly north to secure the Baji road and oil refinery before securing, regrouping, and supporting Ramadi to make sure the ISIS advance there is halted. And then, of course, there will be a few-months' ramp-up to take Mosul. The advance into Tikrit was halted around March 6th as the army/Shiite militias faced heavy sniper fire and dug-in pockets of resistance. US airstrikes started up just under a week ago after the Iraqi government requested the support to break ISIS resistance. Those airstrikes prompted most of the 20,000 Shiite militiamen--who generally don't like the US and see themselves as more closely aligned with Iranian interests--to boycott the siege and go home, leaving about 3,000 Iraqi Army troops, 1,000 Sunni fighters, and about 2,000 Shiite fighters. It left a lot of glaring holes in the siege. But the airstrikes proved decisive. After softening ISIS targets (which had probably thought themselves unlikely to have to face such airstrikes), the US suspended its operations and the Shiite militias quickly came back to launch the final assault. The city fell one day after the air campaign, after 3 weeks of no progress. The US is gloating a bit, and with good reason. US officials are taking the opportunity to show that Iran can't alone support the Iraqi advance. This is a precedent-setting kind of event: the US was "snubbed" last month when Iraq's government moved into Tikrit with Shiite militias and Iranian ground support, without informing the US or requesting support. Giving in to request the support was a sign the Iraqis had realized they need it. The fact that the city was taken so quickly after the strikes cements the US' future role. This means one of two things: either the US and Iran will work more closely together, or the Iranians will have a much-reduced role in the Iraqi offensives in the future. This cementing also means that the US is going to be leading the assault on Mosul, which is about 20x larger than Tikrit and has many more ISIS fighters dug in. It's clear that the Mosul operation is a non-starter without that air support. Shiite militias will make a lot of noise about not needing the US, but I do believe that Tikrit will be weighing heavily on their minds when they are planning the Mosul advance, and that despite the high tensions, the militias will begrudgingly go in with US air support. It's worth noting: Tikrit probably had far more than the 2,000 ISIS fighters initially estimated--the Iraqi government cites about 13,000, but this is probably inflated. The good news is that this means the Iraqis have shown that they can win with about 2:1 odds, rather than the 10:1 or 15:1 previously thought. Mosul also has about 12,000 ISIS fighters, so the fight will not be an order-of-magnitude difference (though will obviously take much longer and be more complicated due to Mosul being about 20x larger in land mass). But ongoing US airstrikes are making it hard for ISIS to dig in as deeply as it would like, and the ISIS governor ("Prince of Mosul") and Mosul's top ISIS military commander have both been killed by airstrikes. 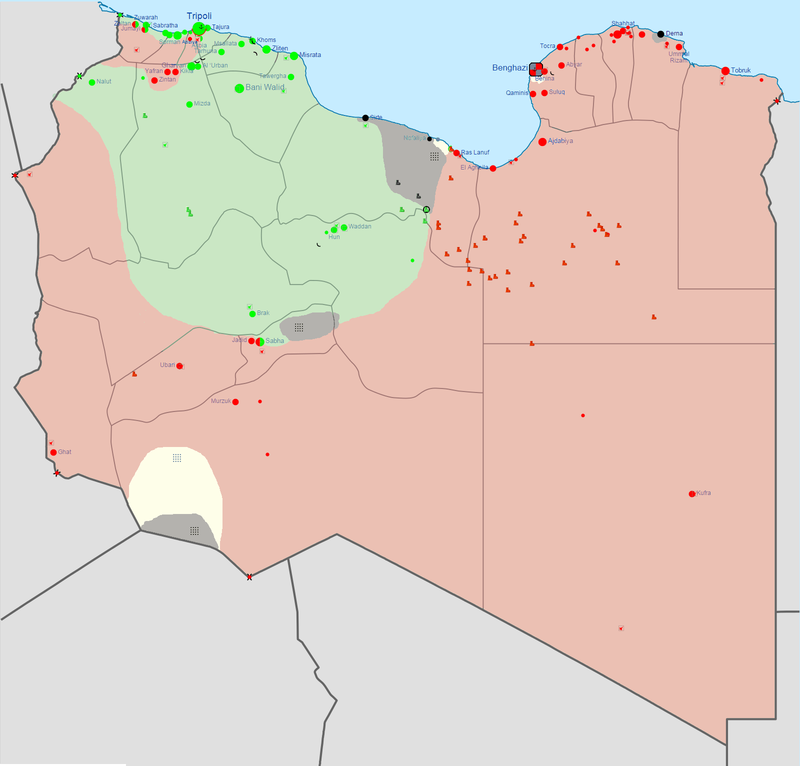 The key bit of news for Libya is that as of March 20th, the Libyan civil war is back on in full swing, and Tobruk government forces are quickly moving to surround Tripoli. They seem to have caught Libya Dawn—who has been focused on fighting ISIS—off guard. · Tobruk Government: the newly-elected parliament (House of Representatives) and Presidential Council. Backed by the army. Generally considered the legitimate government due to having won the most recent elections. · Libya Dawn: the greater Islamist umbrella siding with the “New General National Council,” which was the General National Council until they were defeated in elections and refused to step down. Also called just the “Islamist Government” due to being an alliance of Islamists from the Muslim Brotherhood to Ansar al-Sharia (and the electorally-defeated New GNC is highly Islamist). More in my recent post on Libya, here. 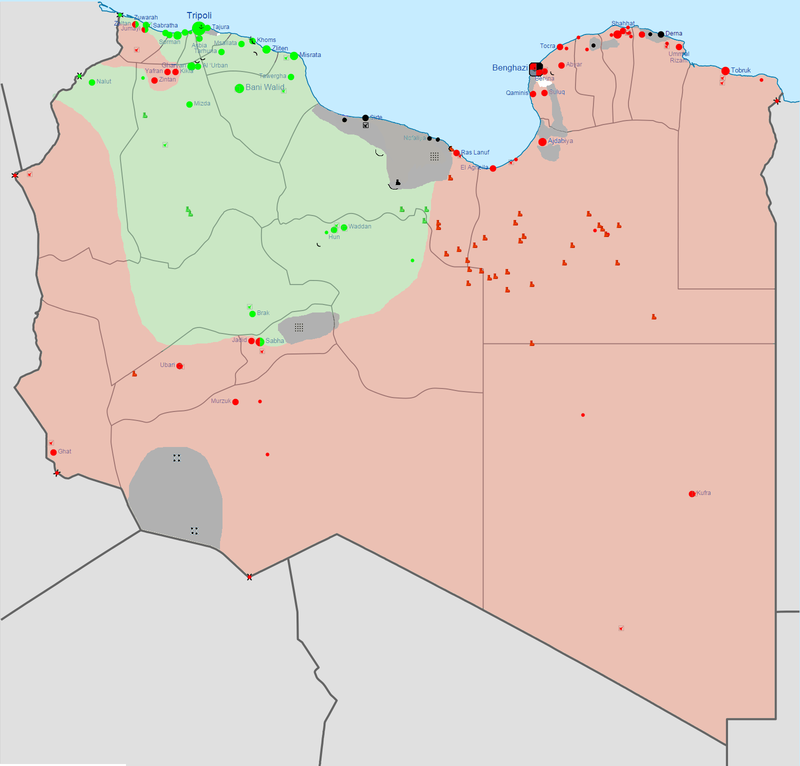 · January 16th: Libya Dawn and Tobruk Government ceasefire. Unity Government talks launched. Jan 21 Map Post-Ceasefire. From Wikipedia. 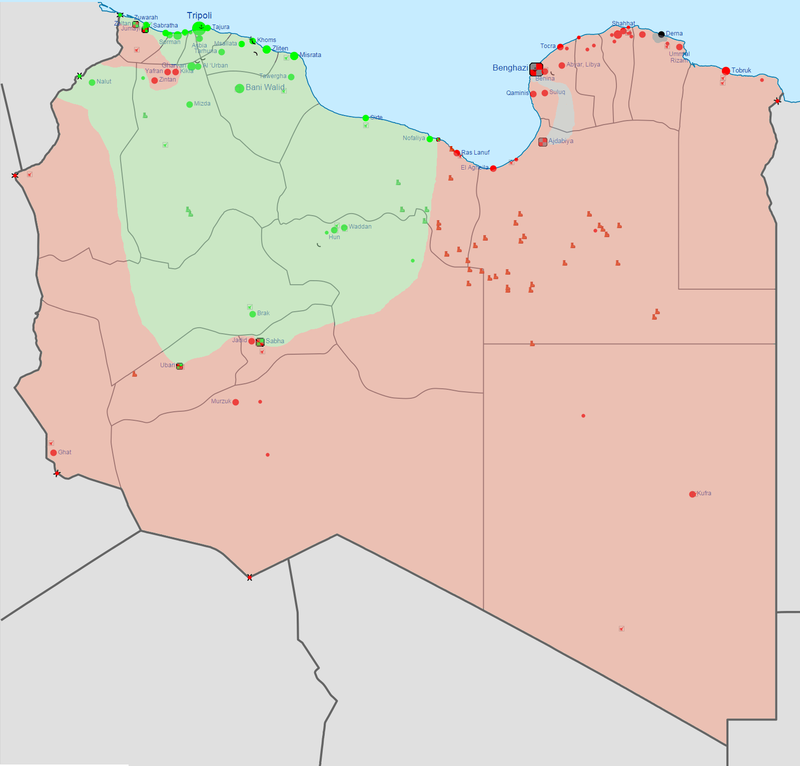 Red = Tobruk Gov't; Green = Libya Dawn; Grey/Black = ISIS. · Interregnum period: lots of fighting with ISIS. · Feburary 20th: Tobruk Government’s House of Representatives votes to cut off talks with Libya Dawn / New GNC. March 22nd Map With Tobruk Gov’t Assault. Note ISIS Positions Contracting. Note white = Ansar al-Sharia. The fact that Tobruk Government forces were so quick to make progress to surround Tripoli suggests they were able to conceal the size and position of their forces. Despite being beaten back in the past 2 months, ISIS is likely to make a comeback as Libya Dawn and Tobruk focus on each other. With Iran-backed Shiite Houthis pressing down on Aden (the last major stronghold of elected-government forces), on March 25th Saudi Arabia decided to (at the behest of Yemen’s President) launch a military operation to push the Houthis back and restore the government. They’re claiming currently that they have a 10-country Arab (probably all Sunni-controlled) coalition, and they have amassed heavy weapons and troops along the border, just north of the Houthi’s strongest presence. The Saudis have launched airstrikes to get things started, likely as they organize for a ground assault with the rest of the coalition. Egypt is sending ships to the area right now for support. March 22nd. Red = Gov't forces. Green = Houthis. Yellow = South Yemen Separatists. Grey = ISIS/Al-Qaeda. Yemen is the hottest spot right now for the ongoing Sunni-Shiite regional war and the Iranian/Arab regional war, which have very high overlap. Syria’s civil war is the secondary battleground, though outside nations are not committed to invading directly and are wary enough of the strength of ISIS that they are taking a break of sorts. In Iraq, all parties seem so dedicated to beating ISIS that the hottest parts of the Sunni-Shiite fighting have been put aside almost entirely. Iran will probably not respond militarily here other than to try to beef up Houthi forces; at this point neither the Gulf States nor Iran want all-out war--expect their conflict to continue as a series of proxy wars. 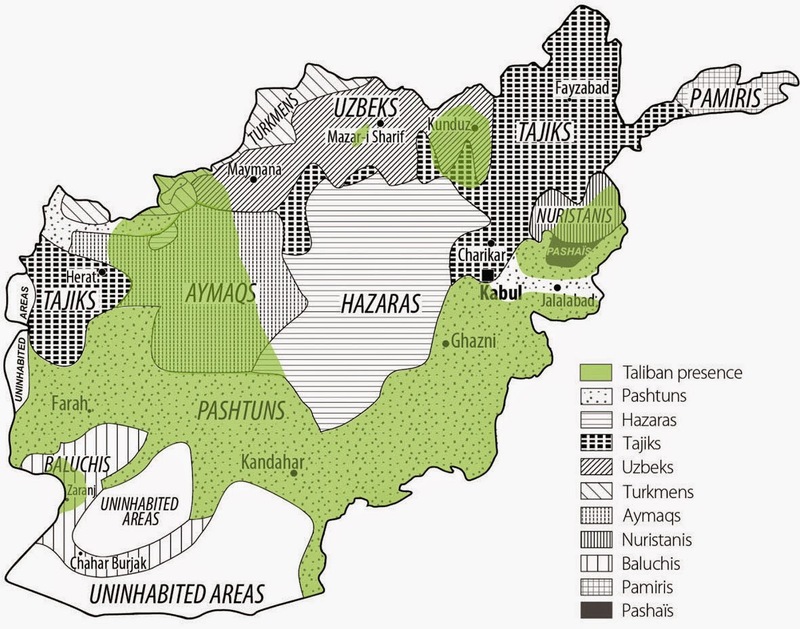 Afghanistan has been largely forgotten (including by me) as the rest of the middle east has erupted, in large part because Afghanistan is in a surprisingly "stable" stalemate--not that the country has stabilized, but that there isn't much movement one way or another. I decided to finally get back to writing about Afghanistan after reading that the US is now planning to keep troops in Afghanistan through 2016--right up until President Obama leaves office. Fighting with the Taliban is up big time in 2014, with the most civilian casualties on record. Obama claims to have great faith in president Ghani, who seems to be less of a strongman and less corrupt than Karzai. ...even as the NATO coalition pulled out and got less involved in operations (and thus its casualty rate has dropped precipitously). This means that, indeed, the Afghanistan National Army is getting comparatively stronger and more capable compared to the Taliban. Unlike the Iraqi army forces, there isn't much worry of the Afghans simply splitting and running. The bad news is that corruption is still a major problem, and that opium production has gone through the roof since the British withdrawal--it's higher than it's ever been. This means lots of money for the Taliban and a sign of very little government control in southern Pashtun regions (Helmand/Kandahar). In the end, I hold by my 2013 prediction (it's a bloody good article--go read it) that in 2015 the Taliban will attempt an offensive, fail to take over the country, and negotiate. Those negotiations are coming, in large part due to Ghani's charm offensive to get Pakistan to pressure the Taliban into making the talks happen. I think this is the real reason Obama wants to keep some troops around--to apply pressure during the negotiations. I don't think it's because of just blind faith that Ghani is going to make the situation better before Obama is out of office--that would be naive in the face of recent history. caused in large part by arbitrary colonial boundary-making (the infamous Durand Line). This means, I think, that it'll end as most of these do: slowly, painfully, and with an awkward peace deal that'll have many hiccups down the line. 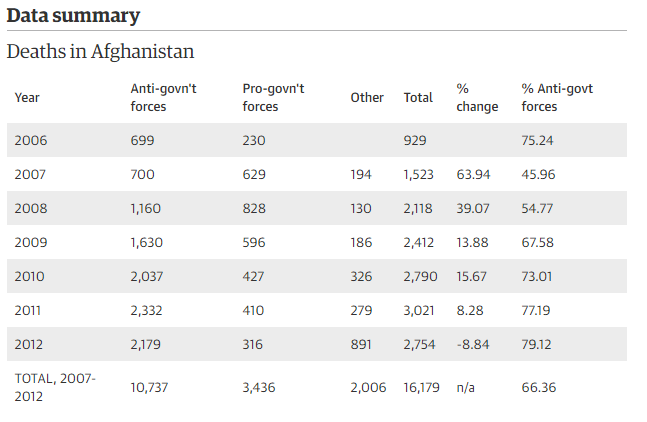 The good news for the Afghan army is that even though fighting is intensifying (to be predicted as NATO troops withdraw and Taliban forces try to use the opportunity to beat up the ANA and win bargaining power), the Taliban are consistently losing in these fights 4:1 or 5:1. That continued losing means they are likely hurting and more eager for a deal. The rest of the middle east may remain such a mess that the Taliban will be considered almost reasonable by comparison once they make a peace deal. I'm not kidding. There are over 100 ISIS/ISIL fighters in Afghanistan--20 of them have been killed by the Taliban, who apparently want nothing to do with them. No surprise--at best, they're competitors for power (as they want to make Afghanistan part of the Caliphate and the Taliban are ultimately a nationalist/ethnic insurgency). I doubt they'll gain a major foothold. The number of Afghan children attending school has increased 7x since 2001, including now 3.2 million girls (versus 5 million boys), up from 10,000 girls. The nuclear deal with Iran is entering the final stages of getting to "in principle" agreement--here's the general outline. It's not clear whether the US and Iran will make a deal, but the political will is definitely there, and that's the most important part. Though I have some reservations, I endorse the deal--I think we should make it, if what shows up in June sticks to the general outline that we know now. In short, it cuts Iran down to a scope of production that would make "break-out" time--the time it takes to build a nuke if they got serious--one year, which is a pretty long time. Even assuming they can ramp up much faster, it gives the US time to do something about it. The door would need to be open to inspectors, which gives at least enough monitoring to know if Iran is sneaking around. "It's only 10 years." A lot changes in 10 years. The idea of permanently keeping a country from having a domestic, peaceful nuclear power program is something that's just not going to fly. The West is hoping that a good deal and thawed relations will bring out the moderates in Iran and make it a place we're not so worried about anymore. 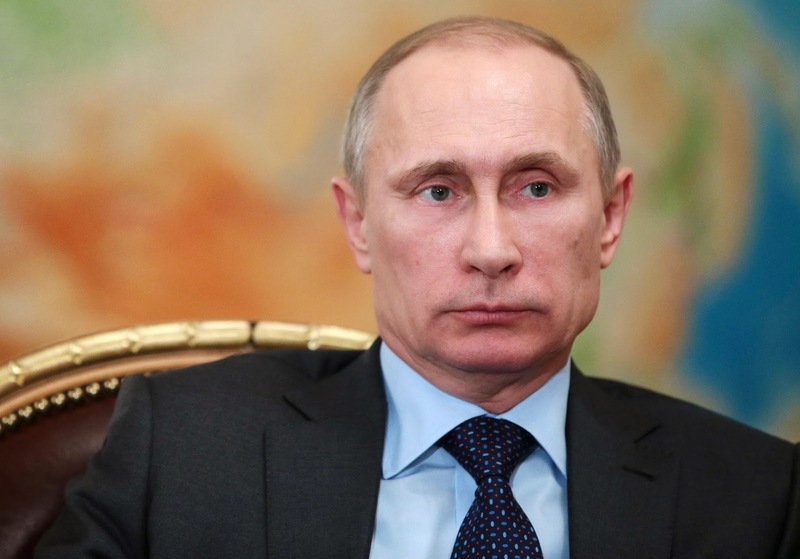 "If we drop all sanctions, we lose bargaining power." 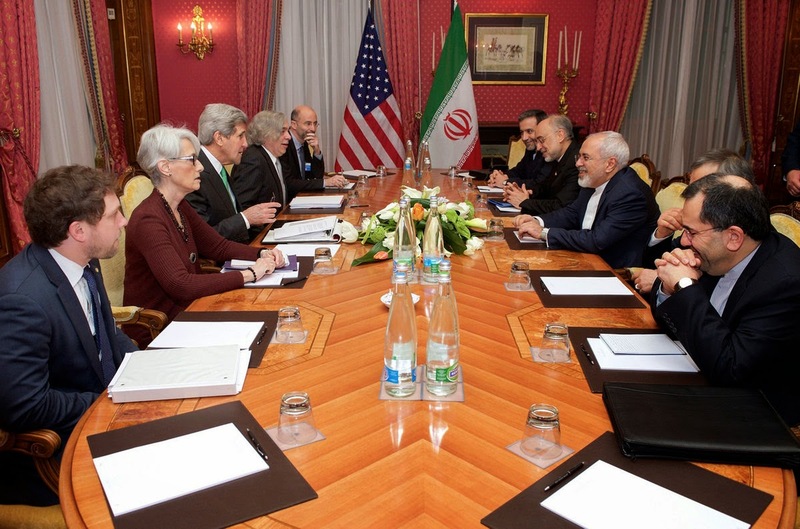 If Iran holds up its end of the deal, the US doesn't really need further bargaining power on the nuclear issue. It and the rest of the West can always slap the sanctions right back on--that's easier and more immediate than trying to build a weapon or spooling up weapons facilities. Just as the agreement on Iran's capacity limitations expires after 10 years, so does the agreement to have no economic sanctions about the nuclear issue. "What if they break their end of the deal?" If they really break it, the US can still use military force. The biggest concern I had about the deal was that I was worried the US wasn't willing to threaten military force to prevent Iran from getting a nuke. I started considering whether the President was trying to be clever about messaging, as he is doing in relation to ISIS. 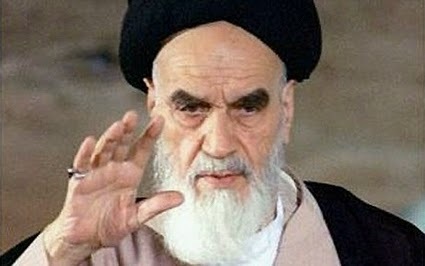 A Nobel Peace Prize winner does not lower himself by threatening war if he does not get what he wants. Luckily, his hand-picked Director of the CIA can do just that, and has. The President gets to keep focusing on the positive and being the carrot to the CIA's stick. But there is a subtlety even here: when Obama says that the window for a peaceful resolution is temporary, he means it: the Republican letter to Iran, however hamfisted, makes it clear that the winds may change in the US and that the next President might not be quite so accommodating--and might be more willing to throw missiles at the problem. The best part about a reasonable deal is that it gives legitimacy and political will for military action if it's necessary. Military force is a last resort after diplomacy fails, and if Iran goes ahead and builds nukes under a treaty/agreement not to do so, it becomes easier for everyone to talk about employing military force. All in all, I think the deal is a good one. And long-term, it could work to bring Iran further into the Western fold. I got lazy in deciding to not translate some Hebrew and mis-named Herzog's "Zionist Union" as "Labor," which is inexcusable, though we can think of them similarly. Second, I also failed to take into account the non-linear seat allocations of the Israeli parliament, so my numbers were way off. With 94% of votes in, Likud has a surprise lead with 29 seats to ZU's 24. This is actually so far off of exit polls showing them both closer to 27 or 28 that I suspect there will be a bit of a change as the last 6% get counted (otherwise the exit pollers put up a disappointing effort). The Arab "Joint List" will absolutely not join with Likud, and nor will Yesh Atid--even though they were with Netanyahu's coalition last time, they've insisted that they'll only join a coalition "dedicated to peace," and in Israeli terms, that means the opposition. 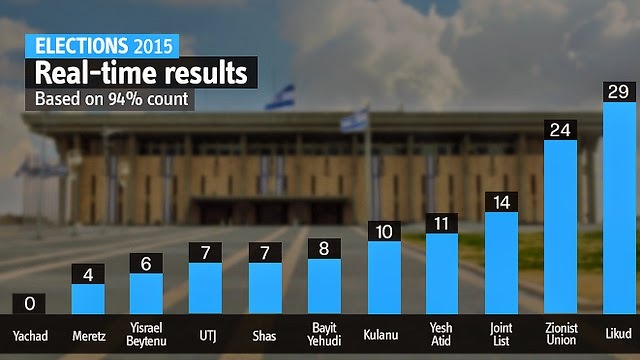 Likud can count on Bayit Yehudi (Jewish Home), Shas, UTJ, and Yisrael Beytenu, which means Netanyahu's current count is 57--short of the 61 needed. Herzog's ZU can count on Yesh Atid, Meretz, and the Arab Joint List (due to its stern opposition to Lukid), putting Herzog's count at 53. It's being said, fairly, that Kalanu (who did better than expected) is poised to play "kingmaker" by joining whatever coalition they please. They're centrist and have worked with Likud in the past, but have made it clear they're willing to go either way. Netanyahu "has the ball" in being invited to form a coalition, but to some extent it doesn't matter: Herzog has every right to also be courting Kalanu. Kalanu's moderating force might be very powerful when they make a deal. I'm still predicting Herzog will catch Kalanu and win, primarily because I think that Netanyahu burned too many centrist bridges by pledging to continue building settlements and avowing that Palestine would never become a state: I think it's just too extreme a position to attract Kalanu, but Netanyahu may be willing to back down: he's a shrewd politician and won't let last-minute campaigning declarations keep him out of power. All zero-sum international negotiations are shaped by the size of the guns on the table. This is the dark reality of diplomacy: when one is trying to convince someone to give up a critical behavior (stop a nuclear weapons program, stop invading Ukraine), or start a new one (less common on the modern world order), the key unspoken factor underlying the negotiations is the potential use of force. At this point, it's unlikely that the US is going to get what it wants in any of these negotiations, due to one simple fact: it lacks the will to exert its power, and therefore has no bargaining power. In essence, when the US is trying to compel behavioral change, the other partner asks, "what are the consequences if I refuse?" Currently, the answer is "nothing," so there is no reason to agree unless the carrots are really, really big. And the US currently has no stick available, as it is unwilling to go to interstate war. And in this, it brings no guns to the table: they're all left at home. In Iran, Professor Muravchik suggests that the Iranians are so ideological and bent on empire that sanctions have little impact, and lifting them (to bring material prosperity) just isn't important enough for the Iranians to not also require a "stick" to change the equation. But despite the blundering letter by 47 Republican congresspeople, the US is not willing to strike Iran's nuclear facilities with aircraft. In fact, the President might have said that he'd even shoot down Israeli planes doing the same. Because the US has no appetite for war, Iran can hold out indefinitely--it gets what it wants by doing nothing, and will only be moved if the US offers something somehow better than nuclear weapons--I just struggle to imagine what that would be. In Russia, the game is similar. I won't speak at too much length here as we mention it in a recent post, but in summary: Putin enjoys over 80% approval (compared to Obama's 47% and US Congress' 8%) domestically despite the West's sanctions and the drop of the ruble. This won't change, even with more sanctions. Until and unless the US or NATO are able to credibly threaten a military response, Russia will continue to take advantage of the relative gap in resistance to establish its status quo rule over Georgia, Ukraine and probably the Baltics. Despite the US' ongoing frustration with Israel's settlement construction in the West Bank and suspended peace talks with Fatah, threatening to withdraw the over-$3Billion/yr military aid to Israel is simply not on the table, probably due to concerns for Israel's immediate security. It's a different example than Russia and Iran, but another place where the US is unwilling to use a threat of risk to a nation's security in negotiation. Until this changes, the US will have no bargaining power here or with China, North Korea, the Taliban, Syria's Assad, or any other frustrating group. Whether or not some of these issues are worth military intervention is a question that should be taken on a case-by-case basis. The point of this article is to simply drive home the fact that negotiations with powers like Iran will always end in failure if the military option is totally off the table; it is unwise to expect anything else. 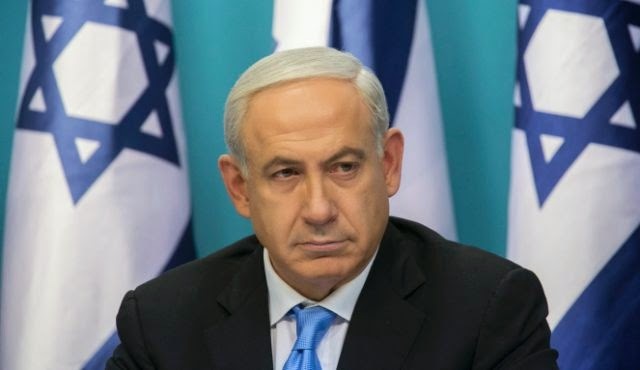 Israel's next parliamentary elections happen on March 17th, and a major potential foreign policy shift could happen if Netanyahu's Likud party doesn't win. Looking at stabilizing opinion polls, I predict that a Labor-led coalition will win, carrying somewhere in the region of 57 to 61 seats (of 120). I think the big X-factors will be whether it can/wants to pick up the communist Hadash party (likely) and the Arab Balad party (maybe?). I suspect they would not take on the Islamist UAL party. It could be a minority government, but it's likely to hold the day nonetheless. The Labor coalition would likely look like: Labor, Hatnuah, Yesh Atid, Meretz, Kalanu, and Hadash, which together carry 57 seats in current opinion polls. If they picked up Balad, they would hit 60 or 61 seats, enough for a slim majority. Since UAL, Ta'al, and Balad (together with 9 seats of support) simply wouldn't join Likud due to their anti-Zionist ideologies, the Likud coalition (Likud, Yisrael Beiteinu, Jewish Home, Shas, UTJ, Otzma, and Yachad) looks primed to hold 54 seats. The trouble for Labor's coalition is that it would be a bit unwieldy, requiring getting general agreement from socialist/labor, communist, liberal, and Arab parties. The good news is that the smaller groups are so unlikely to jump to support Likud that their bargaining power isn't too high in driving policy (unlike the Lib Dems of the UK, which got to play Kingmaker in the 2010 parliamentary elections there). Labor might take an approach to end or roll back Israeli settlement of the West Bank, and maybe even lift the blockade on the Gaza Strip. It would be an interesting change in foreign policy, indeed. We'll keep our eye out if the polls look to change. Iraqi forces have Tikrit surrounded, after a week-long slog of clearing out bombs and snipers along the roads leading into the city. They are entering the city from all sides now, attempting to squeeze out (and ideally eliminate during retreat) ISIS forces holed up inside. I believe at this point that victory is fairly inevitable, and that they'll move on next to clear ISIS forces currently combating government / Shiite troops in Baji. 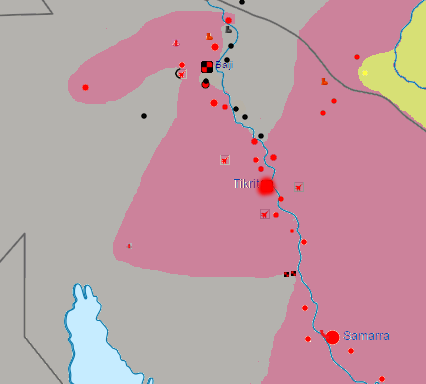 Expect the area below to become quite red after ISIS forces break. The going will be slow now that they're in the city: ISIS predicted this was coming and scattered snipers and booby traps throughout the city, in the hopes of causing enough casualties to break the spirits of government troops. But it won't happen. The most important part of this offensive is that Iraqi forces do not break and run, and I suspect they won't. Iraq has hand-picked more reliable forces for this offensive, and the backing of very zealous Shiite militiamen and Iranian Quds forces is going to keep morale high as they demonstrate high morale and relative courage in the fighting. The total forces assaulting the city number a staggering 30,000, which likely outnumbers ISIS forces by about 10:1. There are just so many weapons pointed at ISIS forces that they will eventually get squeezed into defeat. Expect the city to be cleared in 1-2 weeks as forces very slowly and carefully move house-to-house, hoping to minimize casualties. Baji will fall more quickly after that; it has many fewer ISIS fighters and government forces are already in the city, which will prevent the kind of entrenchment that ISIS was able to manage in Tikrit. ISIS' days in Iraq are numbered, I think. Tikrit will be the victory the Iraqis need to build the morale and template for taking Mosul, which will allow them to turn their attention to Ramadi and Fallujah--those will be the hardest fights they have, but they'll have momentum on their side: Iraqi forces will inherit ISIS' air of inevitability. ISIS' aura of inevitability and terror is starting to fizzle as they begin to lose to superior firepower, numbers, and training. That loss will hurt long-term recruiting, which means they'll actually be ground down to the point that they'll have to revert to asymmetric warfare (they set of 12 simultaneous car/suicide bombs in Ramadi and one bomb in Baghdad to try to disrupt the assault on Tikrit, for example). But because ISIS is claiming to be a caliphate, their authority erodes if they don't hold territory. With victory coming, the most important factor in this advance is making sure that Shiite militiamen don't use this opportunity to carry out sectarian revenge killings. If they're able to keep their cool (and so far it's looking like they are, but the hard part will be after the main fighting ends) and leave Sunni civilians alone, the prospects for Fallujah and Ramadi will improve as Sunni civilians there begin to hope that government forces are a viable alternative to ISIS (they had previously probably helped ISIS to take hold there because they were so frustrated with Shiite rule in Iraq, but ISIS became more than they had bargained for). 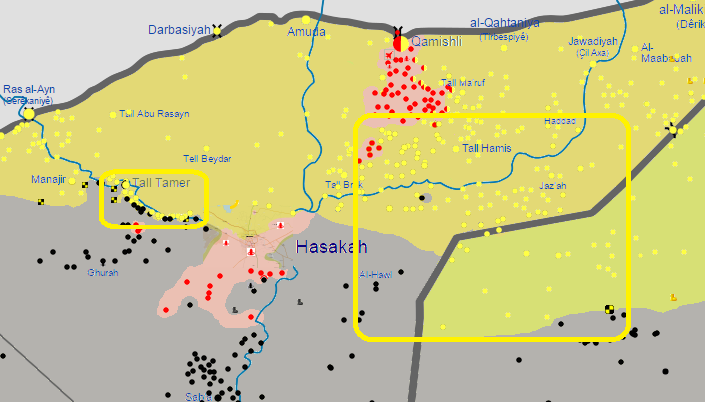 Meanwhile, the Kurds in Syria continue a slow, steady slog towards the Tall Abyad border crossing with Turkey, which would close down a supply and reinforcement route (for foreign fighters) into Syria. Why Does the US Have So Many Aircraft Carriers? And a New Project! Great post today that deviates significantly from my normal "analyze a cool current situation" style. It's an educational piece designed to get you thinking, in the spirit of a new project that I'm launching where I'll be putting in a lot of effort, called Something to Consider. It's a blog/forum/community designed to go after the problem of broken political dialogue, and I do the blogging (and everything else)! I'm really excited about it and would love if you took a look. When we discuss the US’ military spending, we can frequently see that by some measures it spends more than the next 9 countries combined (6 of which are US allies). But even more skewed than simple spending is the US’ navy might, represented primarily by its aircraft carriers. It has a whopping 19, 10 of which are “supercarriers” that travel the world in strike groups, accompanied by destroyers, cruisers, submarines, and supply ships. This is more than the rest of the world put together by a healthy chunk. It’s even more stark a comparison when you see that not all aircraft carriers are made equal. 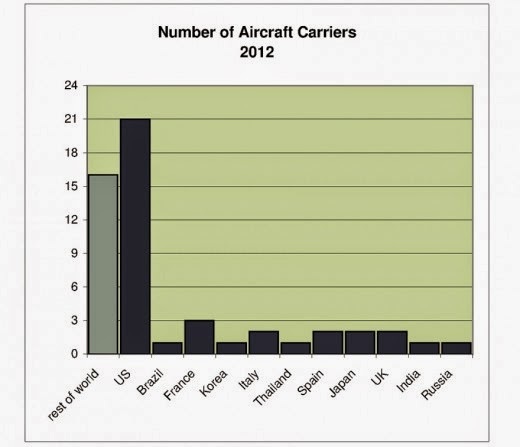 The US’ 10 super-carriers are rivaled only by one each from France, Russia, and China. This enables the US to carry about 3x the aircraft on the sea as the rest of the world (and these aircraft are far more advanced than almost anyone else’s--making most potential battles highly one-sided). Holy smokes. That’s a lot. And it costs a lot. The fundamental underlying theory is based loosely in the idea that “someone has to.” In some circles it’s known as “Leviathan” theory, which says that security stability is best preserved when a single force has credible and overwhelming power--if anyone “misbehaves,” that force can quickly dispatch with them. Most of us are accustomed to the seas being free for trade. So accustomed to it, in fact, that we have very little concept of a world without free trade, and the incredible economic and social benefits that come from it. Before the end of World War II, trade disruption was common, either by privateering (legitimized piracy), blockades (enforcing non-trade policies by different countries in economic “competition”), or outright naval attacks. The lost trade was measured of course not only in blocked/attacked ships, but by the innumerable ships that never made the trip because of these disruptions. At the end of World War II, the US generated a whopping 60% of the world’s GDP and had a navy larger even than the British Empire. It made a very clear policy decision to be the keeper of global free trade by having an uncontested rule of the sea. Obviously everyone gains from having free trade routes along the sea, so the US bearing the burden itself seems like a classic “freerider” problem--one party pays, everyone benefits. But the US is uniquely positioned geographically to benefit from free seas. It spans the continent and has easy sea access to Europe, Asia, and South America--no other country can say this (excepting maybe Mexico). Europe and Asia must travel a long and difficult route to trade with each other; the barriers to trading with the US are much lower. 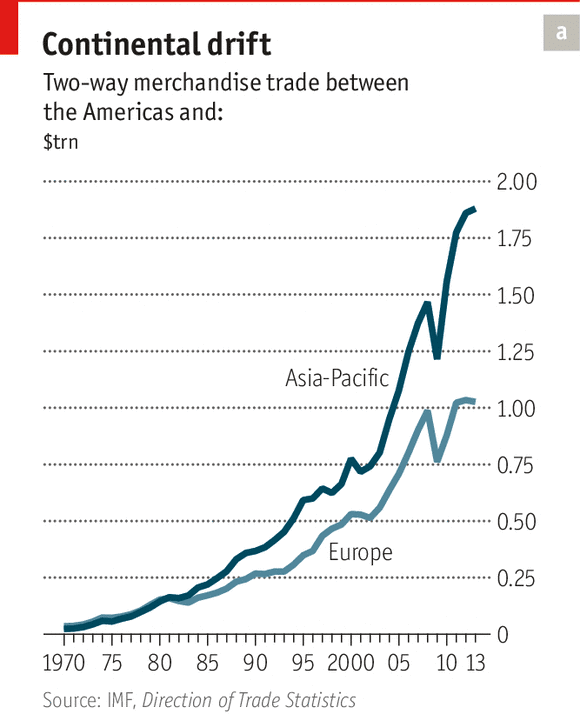 In the 2nd half of the century, the American Age began, as US trade with Europe (and then Asia) skyrocketed. The US also benefits from free trade in other countries as it has moved to being a tech and services economy: it imports many products and the prices of those products are lower when manufacturing countries have easy access to raw materials or specialized parts. As a net hydrocarbon exporter, the US benefits greatly here, as well. The US being cut off from trade anywhere would hurt its economy significantly. The US loses not only from being blockaded (as ridiculous a concept as that is, currently) but from being cut off in limited areas. 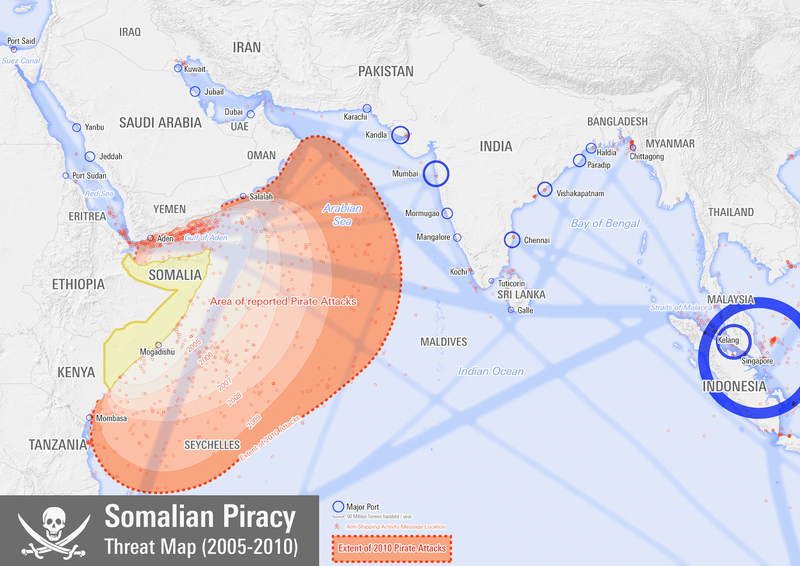 Consider for example piracy near Somalia in the late 2000’s. It could have highly disrupted trade through the Red Sea and Suez Canal if the US was not able to mount an effort to counter the piracy by bringing overwhelming force to the area. 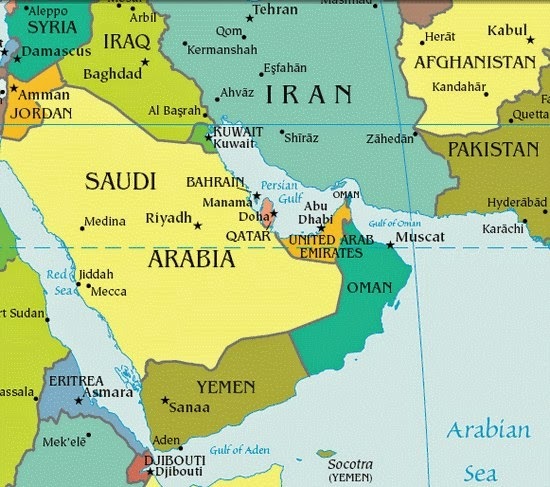 Consider also the Persian Gulf, where the US and others trade with Kuwait, Iraq, Saudi Arabia, Qatar, and the UAE. Iran has at times threatened to shut the gulf down, but overwhelming US naval strength makes that prospect unlikely (and very costly/debilitating for Iran if it gets to shooting). The idea, then, is that while everyone else benefits without paying, the US might consider its naval carrier spending to be a good investment for its own economy anyway. Does it pay off? Impossible to tell: one simply cannot estimate how much trade would not have happened and what kinds of disruptions would have occurred (or how investment confidence might have been lowered) if there was not a Leviathan force keeping the seas free. 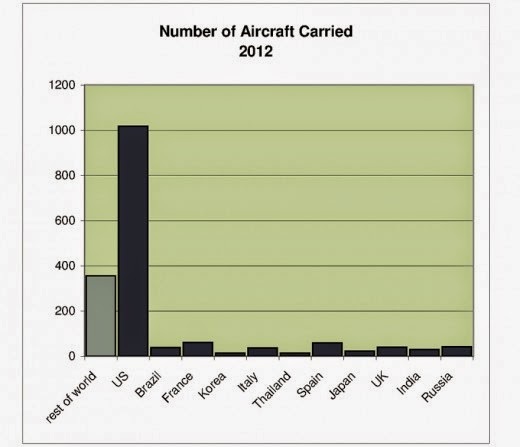 So if you were wondering why the US keeps such a mighty fleet: that’s why. For more educational and thought-provoking content, go check out the Something to Consider blog. Go sign up for RSS or email and hope to see you in the comment threads! Readers keep telling me they love the maps, so you get maps and a bit of "implications." We'll also touch very briefly on Tikrit. 1) Kurdish forces out of Kobane have successfully pressed ISIS out of the space west of Kobane by trapping them against the river/lake and eliminating them. 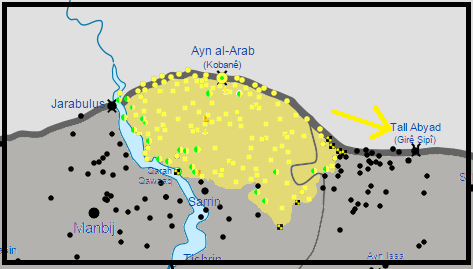 They've made modest progress in the east but I think we can expect the Kurdish forces to shift a bit south, but mostly east, to capture Tall Abyad crossing and cut off a supply line for ISIS from Turkey. 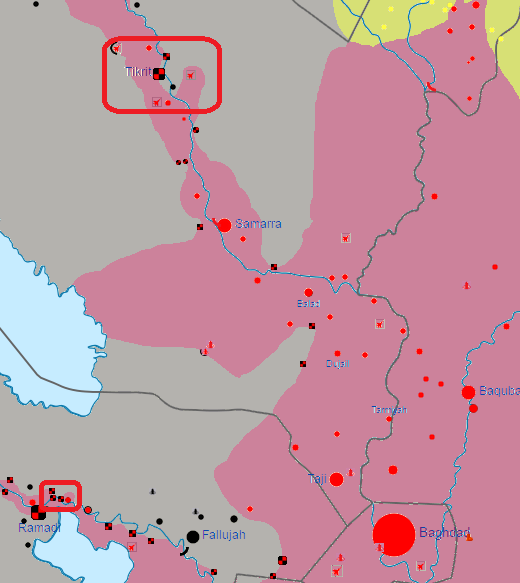 2) In northeast Sryia, ISIS has totally collapsed. That huge box on the right was all formerly ISIS, right up to the southern edge of that big red blotch (government fighters). It appears the Kurds and government troops have a truce, which has allowed them to push out. 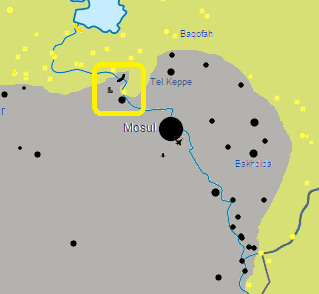 There is likely a bit of a "race" to secure space around Hasakah between Peshmerga and government forces. 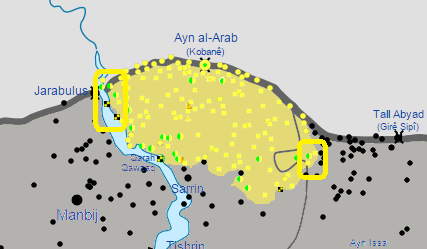 We also see in the western box that Kurdish forces have successfully crossed a river and are assaulting villages there, likely hoping to scoop up the smattering of black just to the south. 3) From the department of "great things come in small packages," the Kurds have successfully captured the roadway and villages around the bridge where Route 1 crosses the Tigris, cutting Mosul off from its most direct western supply line. This is a form of kicking the proverbial hornet's nest that may bring ISIS fighters out of dug-in fortifications to try to take the highway back. They're going to have plenty of time--Iraqi forces will be bogged down in Tikrit for a while. 4) Iraqi forces are probably trying to encircle Ramadi by taking villages to its north (lower-left box) and have entered Tikrit. In Tikrit, government forces are similarly trying to encircle the city before moving in, and are being slowed down by roadside/car bombs and suicide bombers. 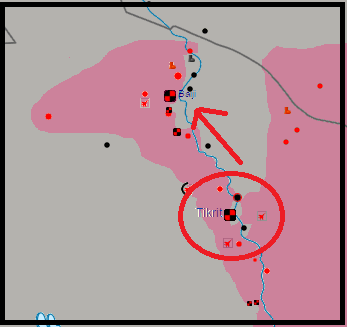 The little black dot south of Tikrit is being shelled at time of writing, and the dot to the north of Tikrit is being de-bombed. 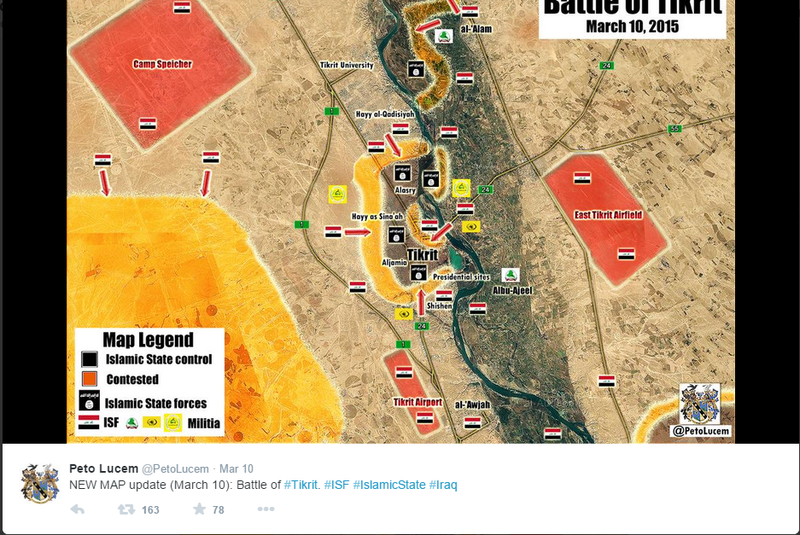 Once Tikrit is surrounded, it may take up to a month to move in and finish off ISIS forces. Iraq is sporting 25,000 troops between regulars, Shiite militias, and Sunni militias. They likely outnumber ISIS forces 10:1--but just remember that Iraqi forces had similar odds when they were overrun in Mosul last summer. Iran is supporting this operation rather than the US, which means no air support. It's clearly not an experiment ("can Iraqi forces handle this on their own?") --now's just not the time to be having such experiments, as Tikrit is probably the junior varsity version of trying to take Mosul. What's more likely--I think--is that Iraq and Iran are going alone, without US "permission." Iraq has been frustrated with coalition support and it's possible (though I have predicted otherwise) that the US announcement of the Mosul offensive created some distrust--Iraq may have decided that the US couldn't be trusted with the intel. Evidence suggests the US wasn't even told about the offensive--a US general said that the offensive was "no surprise," which is very different from saying "we're in the loop." It'll be great news if Iraq can take Tikrit without US air support, though there are huge complications with making this a "Shiite" operation--Shiite militia abuse is a big part of why ISIS was able to get traction in western Iraq in the first place. But we'll deal with that another time.